In accordance with embodiments of the invention, a method is provided for performing a storage operation in a pipeline storage system (10) in which one or more data streams containing data to be stored are written into data chunks. The method includes generating an encryption key associated with a first archive file to be stored when encryption is requested for the storage operation, encrypting the archive data from the data stream using the encryption key to create an encrypted data chunk when a data stream containing the archive file is processed in the pipeline storage system (10), storing the encrypted data chunk on a storage medium (60), and storing the encryption key in a manner accessible during a restore operation of the encrypted data chunk. • Application Serial No. 09/610,738, titled MODULAR BACKUP AND RETRIEVAL SYSTEM USED IN CONJUNCTION WITH A STORAGE AREA NETWORK, filed July 6, 2000, attorney docket number 4982/8 : • Application Serial No. 09/744,268, titled LOGICAL VIEW AND ACCESS TO PHYSICAL STORAGE IN MODULAR DATA AND STORAGE MANAGEMENT SYSTEM, filed January 30, 2001, attorney docket number 4982/10; • Application Serial No. 10/658,095, titled DYNAMIC STORAGE DEVICE POOLING LN A COMPUTER SYSTEM, filed September 9, 2003, attorney docket number 4982/18; and • Application Serial No. 60/460,234, titled SYSTEM AND METHOD FOR PERFORMING STORAGE OPERATIONS IN A COMPUTER NETWORK, filed April 3, 2003, attorney docket number 4982/35PROV. FIELD OF THE INVENTION The invention relates to data transfer mechanisms, and in particular, to a software-based, high speed data pipe for providing high speed and reliable data transfer between computers. BACKGROUND Data, in the process of being archived or transferred from one location to another, will pass through various phases where different operations such as compression, network transfer, storage, etc. will take place on it. There are essentially two approaches that can be taken when implementing such a transfer mechanism. One would be to split the archival process into sub-tasks, each of which would perform a specific function (e.g. Compression). This would then require copying of data between the sub-tasks, which could prove processor intensive. The other method would be to minimize copies, and have a monolithic program performing all of the archival functions. The downside to this would be loss of parallelism. A third alternative would of course be to use threads to do these tasks and use thread-signaling protocols, however, it is realized that this would not be entirely practical since threads are not fully supported on many computing platforms. Accordingly, it is highly desirable to obtain a high-speed data transfer mechanism implemented in software and developed for the needs of high speed and reliable data transfer between computers. It is also desirable to provide a mechanism to encrypt the data being transferred. SUMMARY OF THE INVENTION In accordance with embodiments of the invention, a method is provided for performing a storage operation in a pipeline storage system in which one or more data streams containing data to be stored are written into data chunks. The method includes generating an encryption key associated with a first archive file to be stored when encryption is requested for the storage operation, encrypting the archive data from the data stream using the encryption key to create an encrypted data chunk when a data stream containing the archive file is processed in the pipeline storage system, storing the encrypted data chunk on a storage medium, and storing the encryption key in a manner accessible during a restore operation of the encrypted data chunk. BRIEF DESCRIPTION OF THE DRAWINGS. The invention will be better understood with reference to the following drawings, in which: FIG. 1 A is a block diagram of a network architecture for a system to perform storage operations on electronic data in a computer network according to an embodiment of the invention. FIG. IB is a block diagram of the data pipe architecture in accordance with one embodiment of the present invention. FIG. 2A is a schematic of the data pipe transfer process on a single computer according to an embodiment of the invention. FIG. 2B is a schematic of the data pipe transfer process on multiple computers according to another embodiment of the invention. FIG. 2C is a schematic of the data pipe transfer buffer allocation process from a buffer pool stored in the shared memory according to an embodiment of the invention. FIG. 2D is a schematic illustrating the controlling relationship of the master monitor process to the various attached processes according to an embodiment of the invention. FIGS. 3A-3C illustrate various messages transferred between application processes and the master monitor process according to an embodiment of the invention. FIG. 4 is a schematic of the module attachment process to shared memory space in accordance with the present invention. FIGs. 5A-5B depict flow diagrams of the operation of the sequencer and resequencer processes according to the present invention. FIG. 6 depicts an exemplary data transfer flow among various processing stages within the pipeline according to the present invention. FIG. 7 illustrates a data pipe transfer process on multiple computers having processes with multiple instantiations according to an embodiment of the present invention. FIG. 8 depicts a screenshot of a user interface according to an embodiment of the present invention. Copy has one or more streams related to the number of Drives in a Drive Pool. The system uses a tape media to its maximum capacity and throughput by multiplexing data from several clients onto the same media at the same time. The system allows for a stream to be reserved more than once by different clients and have multiple data movers write to this same piece of media. During backup or other storage operations, data from a data agent to a media agent is transferred over a "Data pipeline" as further described herein and in U.S.
Patent No. 6,418,478 and Application No. 09/495,751. One or more transport processes or modules, such as the Dsbackup in the CommVault Galaxy system, form the tail end on the Media Agent for the pipeline. For example, in the Galaxy system, the Datamover process running as part of Dsbackup is responsible for writing data to the media. For data multiplexing, many such Data movers belonging to different pipelines have to write to the same piece of media. This can be achieved by splitting the Datamover pipeline process into multiple components including a data receiver, a data writer, and other modules as necessary. Network Controller Process 60 on the first machine which contacts Master_Monitor 90B on the second machine where this DataPipe is to be completed using an Extend Pipe message. All information required for establishing the second side of the DataPipe is passed along with this call so that the DataPipe is completely established across both machines. ReceiveBuf(), SendBuf() and FreeBuf(). Dedicated network agents thus map themselves across any network interface on the system, as long as data propagation is ensured. The number of network agents per pipeline is a configurable parameter, which helps this mechanism exploit maximum data transfer bandwidth available on the network over which it is operating. A single dedicated parent network thread / process monitors performance and status of all network agents on that particular machine for a particular pipeline. Referring again to Figure 4, upon allocation of a buffer by AllocBuf() or receipt of a buffer by ReceiveBuf(), the buffer is taken off from the input queue and assigned to the module which performed the call. Upon completion of processing on this buffer, it is passed forward by mean of SendBuf() or FreeBuf() and the buffer is forwarded to its destination queue or it is freed for reuse by FreeBuf(). AllocBuf() decrements the input queue semaphore of the first module and also decrements the semaphore which is the allocator Index for this particular module. Each FreeBufiQ increments the allocator Index of the module who allocated this particular buffer. Information relevant to this operation is always available along with the buffer with which we are performing the free operation. Attachments As the identification process is completed, all modules attach themselves to a specific shared memory space segment that is shared among modules on that machine for this particular pipeline. This shared memory segment has many data buffers, input queues for all stages on the pipeline, and their initial values. Each module identifies its own input queues and output queues depending on the stage that module is supposed to run at, and initial queue (first stage) is populated with number of data segments for sharing on this particular pipeline. Also all modules attach themselves to an allocator semaphore array, which controls the number of buffers allocated by a specific module that can be active in the pipeline. Data Integrity Integrity of the data passed along and the sequencing of data are maintained in part by a pair of special purpose modules termed sequencer and resequencer processes. Figures 5 A and 5B provide diagrams of the operation of the sequencer and resequencer processes respectively. Referring to Figure 5A, the sequencer process receives each buffer (module 10), reads the current sequence number stored in memory (module 20), and then stamps the buffer, and then stamps the buffer with the current sequence number (module 30) and sends the stamped buffer to the next stage for processing (module 40). The current sequence number is then incremented (module 50) and the process is repeated for each buffer received by the sequencer. The resequencer is operative to receive all input buffers and store them internally and wait for the required predecessor buffers to show up at the input queue before forwarding them all in the next sequence to the next stage of processing. Referring now to Figure 5B, the resequencer receives a buffer (module 10) of data and determines the sequence number associated with that buffer (module 20). The buffer is then stored in internal memory (module 30) and a determination is made as to whether all preceding sequence numbers associated with buffers have been received and stored (module 40). Until then, the re-sequencer waits for the required predecessor buffers to show up at the input queue. When all predecessor buffers are available, these buffers are sent (module 50) to the next processor stage. The sequencer/re-sequencer process pairs thus ensure proper data sequencing across a set of network reader/writer modules having multiple instantiations of a particular process. Note however, that when there is only one instance of a module present at any particular stage, by virtue of the queuing mechanism available with all input queues, data sequence in the right order is insured. Hence, in the preferred embodiment, all data pipe transfers employing multi-instance stages via the sequencer/resequencer processes ensure that the input sequence of sequence numbers are not violated for each instance of the module. Further, the restriction that all modules of a specific multi-instance stage should be of the same type eliminates the chances for preferential behavior. Fairness The concept of fairness means that each task will be assured of getting the input buffers it needs to operate on without waiting longer than necessary. Fairness among the modules in a given DataPipe where no stage of the pipeline has more than one instance is automatic. As the tail task frees a buffer it enters the free buffer pool where it may enable the head task to allocate it and begin processing. All tasks in the DataPipe operate a maximum speed overlapping the processing done by other tasks in the preceding or following stage of the pipeline. If a DataPipe has stages consisting of parallel instances of a task, fairness among those tasks is assured by using an allocator semaphore which counts from MaxJBuffers / NA (where NA is the number of allocators for this DataPipe on this particular machine) downward to zero. All FreeBuf()s increment this semaphore back, however, there could be only Max_Buffers /NA buffers allocated by any allocator module in this DataPipe. This ensures that all allocators get a fair share of the available total number of input buffers. If a particular process attempts to allocate more buffers than it is allowed, the master_monitor process prevents such allocation, causing the process to either terminate or wait until a buffer currently allocated to the process becomes freed thereby incrementing the semaphore back up to allow the process to allocate another buffer. Control Messages All instances of all modules have a control socket to Master_Monitor over which control messages are exchanged. All network readers / writers have an analogous control socket to their parent network agent. The parent network agent itself has a control socket to Master_Monitor. Each module periodically checks its control socket for any messages from Master_Monitor. Critical information such as a STOP_PJPE message is passed to Master_Monitor via this mechanism. Status Monitoring Each module initiated by MasterJVlonitor on a given machine is monitored by either a parent network process (in the case of network reader or writer), or by Master_Monitor itself, for states of execution. In case any module is reported as having terminated abnormally, Master_Monitor identifies this exception, and signals all the modules on that particular pipeline to stop. This is done by means of control messages through control sockets as described previously. Upon safely stopping all modules pertaining to this particular pipeline, it signals the remote machine's Master_Monitor to stop the remote side of this particular pipeline and entire pipeline is shut down safely by means of control message signaling. Implementation In a preferred embodiment, DataPipe is implemented on Sun Solaris or HP-UX operating systems and incorporated into Release 2.7 of CommVault System's Vault98 storage management product. FIG. 6 is an illustrative example of the sequence of primitive commands used to set up a DataPipe. The DataPipe is then used to process data in three modules named A, B and C. To set up the DataPipe the Master_Monitor for this is called giving it the name of the DataPipe and the names of the modules that will use the pipe (module 10). Master_Monitor (Mtiate_Pipe(Sample_pipe,A,B,C)). Within the logic of module A, Alloc_Buf() function is then called to obtain a buffer (20). The logic of module A may perform any actions it wants to fill the buffer with useful data. When it has completed its processing of the buffer (30), it calls SendBuf() to send the buffer to module B for processing (40). Module A then repeats its function by again calling Alloc_Buf() to obtain the next buffer. The logic of module B calls ReceiveBuf() to obtain a buffer of data from module A (50). It then operates on the buffer by performing processing as required (60). When it is finished with the buffer it calls SendBufQ to send that buffer to module C (70). Module B then repeats if function by again calling ReceiveBuf() to obtain the next buffer from module A. Module C obtains a buffer of data from module B by calling ReceiveBuf(). When it has completed its processing of the data in that buffer (90), it calls FreeBuf() to release the buffer (100). Like the other two modules, it loops back to receive the next buffer form module B. The primitives used to allocate, free, send, and receive buffers are synchronized by the use of semaphores. This ensures coordination between the modules so that the receiving module does not start processing data before the sending module has finished with it. If no buffer is available, the AllocBuf or ReceiveBuf primitives will wait until one is available. All three modules operate in parallel as separate tasks. The order of processing from A to B to C is established in the initial call to Master_Monitor that established the DataPipe. Referring now to FIG. 7, there is shown another embodiment of the DataPipe apparatus as it is used within Vault98 to provide a high speed path between a "client" system containing a large database that is being backed up to the "CommServ" server and stored as archive files on a DLT drive. Everything on the collect side, of the physical network are part of the client software configuration, whereas everything on the DLT drive side of the physical network are part of the server software configuration. The "collect" activities on the client prepare data to be sent over the DataPipe to the CommServ. Figure 7, which is similar to Figure 2B, depicts a two computer configuration where a header task 15, identified as a collect process, is initiated via Master_Monitor daemon 90 A on the first computer. Collector 15 retrieves data from the disk and allocates the buffer from the shared memory 85A for processing the data to be transferred. Collector 15 then sends the data to the compression process 20 which functions to compress the data as it moves over the pipe. As shown in Figure 7, multiple instantiations of compression module 20 are provided at this stage for effectively processing the data as it flows across the system. Accordingly, sequencer 17 initiated by Master_Monitor 90A is coupled directly between collect module 15 and compressor module 20 to stamp each of the buffers with the sequence number as described previously. Re-sequencer module 23 is coupled to the output queue of the compression module 20 instantiations to properly reorder and re-sequence the buffers sent from the instantiations of module 20 to content analysis module 30. Content analysis module 30 then receives the buffers from re-sequencer 23, processes the data, and sends the buffers to sequencer 33, which again stamps the buffers and sends them to multiple instantiations of network agents 50A for processing across the physical network via standard network protocol such as TCP IP, FTP, ICMP etc. Network agents 50B are instantiated by network control processor 60B in communication with remote Master_Monitor 90B to provide multiple network agent instantiations, where each agent on the remote side uniquely corresponds and communicates with corresponding agent on the local side. In the preferred embodiment, each network agent 50A on the local side performs a copy of the data in the buffer for transfer over the physical network to its corresponding network agent 50B on the remote side and then performs a free buffer function call to free the buffers associated with shared memory 85 A for reallocation. On the remote side, the network agent 50B receives the data transferred over the network and acts as a header on the remote side to allocate each of the buffers in shared memory 85B. These buffers are then sent to re-sequencer 53 which stores buffers received in internal memory until each of the predecessor buffers are received, and then forwards them to the backup restore process 70 via the send buff function. The backup restore process then functions to write the contents of each of the buffers received to DLT drive 80, and upon completion, frees each of those buffers to permit further reallocation in the buffer pool and shared memory 85B. As one can see, this pipeline could be set up over any high speed network, such as ATM, FDDI, etc. The pipeline is capable of utilizing entire practical bandwidth available on the physical network by means of multiple network agents. In cases where real high speed networks are available (networks which have transfer rates higher than DLT drives), multiple pipelines are set up, to utilize resources available to the full extent. Encryption As discussed above, the system also supports encrypted pipelined data transfer by allowing for encryption to be one of the processes or tasks performed in the datapipe. Data protection in storage management systems is a tradeoff between user's convenience and security, speed of operation and capabilities of the encryption algorithm, length of the encryption keys, government restrictions, and other elements known in the art. There are many encryption algorithms available that vary by strength, speed and other parameters. Most encryption algorithms, however, offer various ways to manage the encryption keys. For example, some implementations include hardware USB devices that can store user's private keys. Whenever that user needs an access to some encrypted material, the hardware unit is inserted into the USB slot, and the key is retrieved from the unit. Some units have built-in encrypting capabilities, providing additional security: the key no longer has to travel over the USB bus. All crypto operations are conducted within the unit itself. More conventional implementations involve storing secret keys in so- called key rings (technically just binary files with some specific format) protected with a user's pass-phrase. The user's pass-phrase is stored nowhere but in the user's head, so the secret keys can be considered to be almost secure. "Almost" because the security of the keys now depend on a human-selected word or phrase, and human languages are known to be quite redundant (1.3 bits for a letter in average English text), plus some sort of dictionary attack is possible. Thus, users and system administrators must chose a system of key management that best suits their particular needs. Users and system administrators also confront the problem of key distribution. If there is more than one computer involved, there will be need for transferring keys from one machine to the other. One can say that a "secure" link is needed. But the security of such "secure" link has to be guaranteed by some other key, which should have been distributed first, but for distribution of which another secure session would be needed, etc. etc. When transferring encrypted data, users generally must confront key management issues and often will want to have precise control over where sensitive information is stored and how this information is stored. In some embodiments, users only want some minimum scrambling, or want only the security of the pipeline connection for secure over-the-network data transfer, and prefer not to enter pass-phrases or use other methods every time they wish to encrypt or decrypt data. Such users will probably be satisfied storing the keys in some scrambled form on the CommServe, media agents, storage media, or other elements of the system. Thus, in some embodiments, for example, in the CommVault Galaxy system, the key management problem divides in two: key management on the CommServe or storage manager and key management on the backup media. To be able to restore encrypted data back, the data encryption keys must generally be stored somewhere. While it is possible to store keys on the media itself where encrypted data is being stored, keys are generally stored in the storage manager or CommServe database/index cache. The CommServe can be configured to trust sensitive data to it unconditionally, or users may agree to store such data on the CommServe, provided that some additional protection is involved. For example, additional protection could be a pass-phrase that only customer knows. Thus, as far as key storage on the CommServe is concerned, we generally have two cases: strong (where keys are encrypted with a pass-phrase) and weak (where keys are simply scrambled in the index cache) With strong encryption key management (also referred to herein as "CS_KM_STRONG"), the data encryption keys are stored on the CommServe protected by some sort of a pass-phrase. For example, the pass-phrase may exist only in the customer's head. Such an encryption scheme offers many benefits. For example, even though the data encryption keys are kept on the CommServe and can be accessed by the storage management software, such as CommVault' s Galaxy software, when needed, the storage manager still lacks one important piece of information without which the encryption keys cannot be reconstructed - the user' s pass-phrase. Without this pass- phrase the keys are unusable, and the data is unrecoverable. In some embodiments, the system prompts the user to enter the pass- phrase every time when a restore is attempted. In other embodiments, the system does not prompt users to enter pass-phrases during the backup (so that Galaxy could get the data encryption key to perform the backup encryption). Asymmetric public-key cryptography is used to facilitate this latter method. Asymmetric algorithms use two keys instead of one. The first key (called public) is not protected, and is used to encrypt the data. The second key (called private) is guarded by all means, and can be used to decrypt the data. Thus, in some embodiments, the system encrypts backup data with the public key (which can be stored unprotected in the CS database), and decrypt backup data with the private key (which will be protected by user's pass-phrase). In some embodiments as further described herein, poor performance of asymmetric crypto algorithms may avoided by using symmetric cipher to perform data encryption, and storing the symmetric data encryption key encrypted with the asymmetric public key. With weak encryption key management (also referred to herein as "CS_KM_WEAK"), keys are merely scrambled in the storage manager index cache and do not generally require a pass-phrase. For example, in some embodiments, users may consider their CommServes to be secure or at minimal risk and thus not require a strong encryption key management scheme as discussed above. Also, users may dislike the additional inconvenience of having a pass-phrase to remember and enter during restores. Thus, the data encryption key is stored in a scrambled form in the database. Something is generally referred to as "scrambled'' if it's made unintelligible by some sort of built-in algorithm, which is not controlled by any key or pass-phrase that would exist separately from this algorithm. Clearly, scrambling is potentially less secure than strong encryption key management, because by isolating the scrambling/descrambling code in the Galaxy binaries, any scrambled information can be restored to its original form. The advantage of scrambling (weak) over pass-phrase (strong) encryption is that both backups and restores will not require user to provide any extra information (such as the pass-phrase). In some embodiments, for example, in an application service provider ("ASP") setting or other similar setting, trust level varies between components of the system. For example, an ASP might maintain Media Agents and CommServes in an ASP- controlled data center, but the system's Data Agents might belong to the ASP's customers. Thus, the Data Agents may or may not be configured to fully trust the ASP to handle their data. In this situation the data being backed up belongs to the customers, and the customers completely trust Data Agents (because they're in customer's physical control), but Media Agents and CommServe databases are handled by ASP, so customers don't really trust either of them. One possible solution is to protect everything with a pass-phrase, which the ASP's customers can set without the ASP's knowledge. There is no real problem here except for the customer now having to specify pass-phrase each time when they perform restore operation. In some embodiments, however, this minor inconvenience can be worked around by means of pass-phrase export files. These files are kept on the Data Agent in a dedicated directory (e.g. /opt/galaxy/PF or some other similar directory) and contain Data Agent's pass-phrase in some scrambled form. Thus, each time a restore starts, the restore process looks for the pass-phrase export files on the destination machine, and if such file is found, use the enclosed pass-phrase to unlock the encryption keys. Thus, the customer can restore his data to his machines w/o having to provide a pass-phrase, but for anyone else (including the ASP), data restoration is impossible without the pass-phrase. In some embodiments, unattended Synthetic Full backups present a different problem. Synthetic Full backups combine a full backup with several incrementals to produce a new full backup. This combining involves running backup and restore pipelines. Since restoring encrypted data generally requires a pass-phrase, unattended SynthFull backups are often impossible when CommServe security is CS_KM_STRONG. One possible work around this problem is to have a copy of asymmetric public key stored scrambled (rather than encrypted with the user pass-phrase) specially for running SynthFull backup processes. The hack is gross, because in theory, the system could be directed to use the same key to run restores as well. Cryptographic protection thus gets reduced to protection by code. Generally, encryption keys are not stored on backup media with the information that they protect since doing so is somewhat akin to locking a house and then putting the keys under the doormat. Yet, if the system doesn't store any information on the backup media, the recovery of data in case of disasters (such as a CommServe failure) will generally be extremely difficult if not impossible. Again, there is a tradeoff here between the overall security of the storage management system and the user's convenience. Thus, in some embodiment, key management on the backup media does occur. For the key management on the media, there are a number of distinct security levels. The first is merely scrambling keys on the backup media. Due to its potential weaknesses as further described below, this method of media key management is referred to herein as MM_KM_WEAK throughout the rest of the document. One weakness to this method is that anyone able to figure out the scrambling algorithm (or anyone able to invoke unscrambling code) will be able to fully recover the backup media without any additional knowledge required. All the strengths of encryption algorithms employed by the system are thus likely nullified by this loophole. Yet, this scheme has some advantages, and some uses: (1) The user never has to remember or enter a pass- phrase. All backups/restores remain fully automatic, and the encryption is 100% transparent to the operator. (2) The data traveling over the pipeline is still encrypted and protected against interception by an eavesdropper. Thus, in some situations, MM_KM_WEAK may be desirable. Another scheme is strong media key management ( "MM_KM_STRONG"). In this embodiment, data encryption keys are stored on the media, but we additionally encrypt them with the user's pass-phrase. The pass-phrase becomes the crucial information that will exist only in the customer head, without which the data cannot generally be reconstructed by third party or even by an encrypted data recovery tool such as CommVault' s Galaxy DrTool. The final method of media key management is referred to herein as paranoid ("MM_KM_PARANOID"). In this case there are NO keys stored on the media at all. Data recovery without the CommServe database will generally be impossible and data recover tools such as DrTool will not work since the encrypted data on the media will not contain any additional information these tools require to decrypt and recover the data. 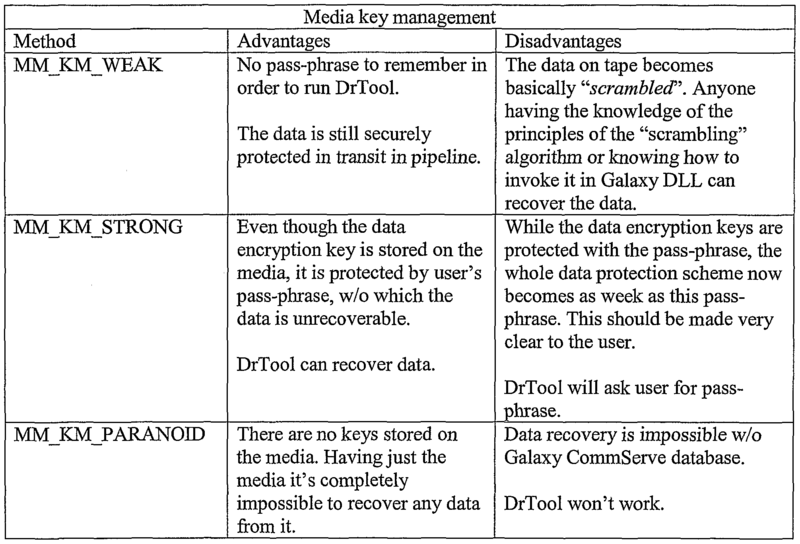 The tables below summarize various advantages and disadvantages of key management schemes on the storage manager and on backup media according to embodiments of the invention: CommServe key management. TTBF ■*•»- enc Blowfish key encrypted with RSA public key. J^ enc, db Blowfish key encrypted with RSA public key and converted to ASCII for storing in the CS database. τ ■**τ■BF netenc Blowfish key encrypted with network password for transmission over the network to IDA or MA. rvBF Initialization vector used in Blowfish CBC mode - unique 64-bit number distributed along with the KBF. 1. The system initiates a request to initialize encryption modules in the data pipeline. For example, CvArchive on IDA sends CNA_GET_PrPELLNEiNFO_REQ to the ArchiveManager and gets back encryption settings for the specified appld (subclient). These encryption settings are used to initialize LNIT_PL buffer dispatched down the pipeline. 2. An encryption module, for example, CvDataPipe, analyses the encryption settings in the LNIT_PL buffer and brings up encrypt/decrypt modules on the IDA or MA as needed 3. The system generates a new encryption key associated with a new archive file that is to be created. For example, CvArchive sends CVA_ALLOC_AFILEID_REQ to ArchiveManager as part of creating anew archive file. ArchiveManager generates a new random Blowfish key KBF and stores it in its memory. 4. The encryption key is propagated to the appropriate encryption modules. For example, CvArchive sends PL_FS_CREATE_AFILE down the pipeline, "encrypt" and "decrypt" modules intercept this buffer and request archive file encryption key KBF from ArchiveManager via CVA_GET_AFILE_BACKUP_KEY. ArchiveManager returns the temporary key that was generated in the previous step. 5. Backup data is being sent through the pipeline and "encrypt" and "decrypt" modules process it as needed: For example, every PL_DATA buffer (tag_header_t::buf_type==PL_DATA) is encrypted, and encryption flag is set in the tag_header_t or other field as appropriate. 6. The chunk trailer is propagated with information regarding encryption and other actions that were taken on the chunk. For example, when it's time to close the current chunk, DataMover sends CNA_GET_CLOSECIiUNKINFO_REQ to ArchiveManager, gets KBF enc, db and KRSApπ enC) db for every archive file in the chunk, and stores them in the chunk trailer. 7. The archive file encryption key is stored for future use. For example, when it's time to close an archive file, DataMover sends CNA_FLN_AFILE_COPY_REQ to the ArchiveManager. ArchiveManager encrypts the temporary KBF for this archive file with the client's κRSApu , stores the result into archFile table, and purges temporary K from memory. OpenSSL, for example, CommNault's CvDataCrypt API, that implements appropriate format of tag data encryption, scrambling, etc. All keys are generally converted to ASCII form before storing them in the database. The scrambler function randomizes the binary data, computes checksum, and encrypts the whole thing using some built-in key. Systems and modules described herein may comprise software, firmware, hardware, or any combination(s) of software, firmware, or hardware suitable for the purposes described herein. Software and other modules may reside on servers, workstations, personal computers, computerized tablets, PDAs, and other devices suitable for the purposes described herein. Software and other modules may be accessible via local memory, via a network, via a browser or other application in an ASP context, or via other means suitable for the purposes described herein. Data structures described herein may comprise computer files, variables, programming arrays, programming structures, or any electronic information storage schemes or methods, or any combinations thereof, suitable for the purposes described herein. User interface elements described herein may comprise elements from graphical user interfaces, command line interfaces, and other interfaces suitable for the purposes described herein. Screenshots presented and described herein can be displayed differently as known in the art to input, access, change, manipulate, modify, alter, and work with information. While the invention has been described and illustrated in connection with prefeπed embodiments, many variations and modifications as will be evident to those skilled in this art may be made without departing from the spirit and scope of the invention, and the invention is thus not to be limited to the precise details of methodology or construction set forth above as such variations and modification are intended to be included within the scope of the invention. What is claimed is: 1. A method for performing a storage operation in a pipeline storage system in which one or more data streams containing data to be stored are written into data chunks, the method comprising: when encryption is requested for the storage operation, generating an encryption key associated with a first archive file to be stored; when a data stream containing the archive file is processed in the pipeline storage system, encrypting the archive data from the data stream using the encryption key to create an encrypted data chunk; storing the encrypted data chunk on a storage medium; and storing the encryption key in a manner accessible during a restore operation of the encrypted data chunk. 2. The method of claim 1, wherein the pipeline storage system comprises a plurality of processes arranged in stages including an encryption process, and wherein encrypting the archive data is performed by the encryption process. 3. The method of claim 1, comprising scrambling the encryption key before it is stored. 4. The method of claim 1, comprising encrypting the encryption key before it is stored. 5. The method of claim 1, wherein storing the encryption key comprises storing the encryption key on the storage medium on which the encrypted data chunk is stored. 6. The method of claim 1, comprising storing on a first storage device an index of storage media used by the pipeline storage system, and wherein storing the encryption key comprises storing the encryption key on the first storage device. 7. The method of claim 1, wherein the pipeline storage system includes a storage management component, and wherein storing the encryption key comprises storing the encryption key on the storage management component. 8. The method of claim 1, comprising inserting a tag in the data chunk indicating that the archive data is encrypted. 9. The method of claim 8, comprising inserting the encryption key in the tag in the data chunk.